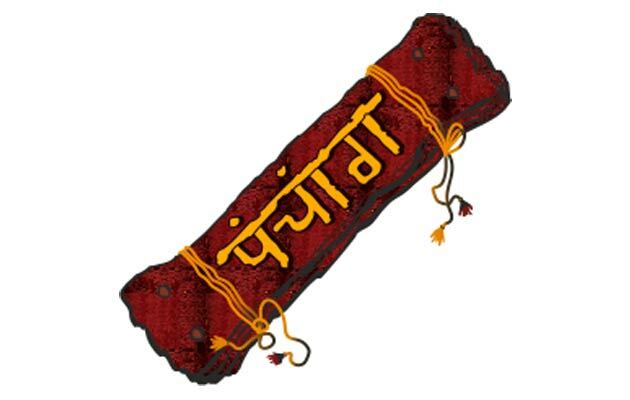 Panchanga is a Sanskrit word which consists of two words pancha+anga. Pancha means five and anga means parts of limbs. So, panchanga means five himbs. Day here is the weekday to decide the lordship of the concerned day. In the Indian astronomy the day is considered to be form Sunrise to just before the next Sunrise. In the Western system, the name of the day is calculated easily from the dates of Gregorian calendar. The exact interval between the two successive vernal equinoxes, i.e. a tropical year, is 365 days 5 hours and 45.3” or, say, 365.2422 days. When it is multiplied by 100, it gives 24.22 extra days (in excess of 365 days per year) in a century. So, Pope Gregory XIII adopted a calendar in 1582 according to which normally years will be of 365 days each but the years which are divisible by 4 without remainder, such as 1988, 1992, etc. will have 366 days, but the centuries, i.e. the year which are multiple of 100 but not multiple of 400 will only 365 days and the years which are multiple of 100 and also multiple of 400 will have 366 days. A lunar month is from the end of one amavasya to the end of succeeding amavasya, ie.e. the difference between the longitudes of the Moon and the Sun start increasing. As there are 3600 in the zodiac, so in a lunar month the Moon moves 3600 more than that of the Sun. There are 30 tithis in one lunar month. The 1st tithi starts when the Moon starts moving ahead of the Sun, i.e. more than 00 difference. When the difference becomes just more than 120, the tithi becomes Dviteeya. Similarly, it is for other tithis. The above is the scheme for the tithis but these 30 tithis falls in approximately 29.5 days and not in 30 days. The Moon moves sometimes fast, i.e. about 150 in 24 hours and sometimes slow, about 120 in 24 hours. Tithis are depending upon the net difference of motion of the Sun and the Moon. Their individual motions depend upon their distances from apogee or perigee. This fast and slow movement of the Moon causes sometimes the losing of a tithi and sometimes gaining a tithi. The principle behind it in the Indian lunar calendar is that the tithi which is at the time of Sunrise is the tithi of the day. Whether that tithi may prolong up to the next Sunrise. A tithi which starts after Sun rise and ends before the next Sun rise is said to be missed in that fortnight. If a tithi which starts just before Sunrise and ends after the next Sunrise will be having two days in its name in that fortnight. The system was introduced for day-to-day working of the society. NAKSHATRA: Vedic Astrology includes 27 Nakshatra who are mythologically belived to be the daughters of King Daksha and Queen of Moon. Moon transits one nakshtra in a day. The nakshatra in which Moon transits at the time of birth is the birth nakshatra. Birth Nakshatra is very important as on the basis of the birth nakshatra the alphabet of name, paya and the dasha is decided. In each tithi there are two karanas. The first Karana ends at the middle of the tithi and the second ends with the ending of the tithi. The two halves are not obtained by dividing the time of the tithi in two halves. Each Karana is decided by the time taken by the Moon to gain over the Sun by a margin of 60 (as against 120 in the case of a tithi). Making a total of 56 + 4 = 60 Karanas in 30 tithis. Yogas are the result of combined movement of the Sun and the Moon. These can be inauspicious or auspicious for arriving at proper muhurta. The names of yogas themselves indicate (from their word meaning) where these are auspicious (good) and were these are inauspicious (bad).